We offer tent camping and bunkhouses for your overnight needs. This will include access to our pool located at the office. Our bunkhouse consists of four separate rooms with each sleeping 15 people on five bunk beds three high as seen in the picture. The entire bunkhouse sleeps a total of 60. Each of the quads comes with a full size refrigerator, microwave, shower, restroom, table, outside grill and picnic table. In the middle of the bunkhouse is a shared kitchen area for bunkhouse guests only. This room has additional refrigerators, ovens, sinks, tables and chairs shared by all bunkhouse guests. You will also have access to the pool. No pets allowed at or inside the bunkhouse. Please note: You will need to bring your own towels, pillows, sleeping bags or linens for the bunkhouse. $20 per person a night with a 9 person minimum in each room. 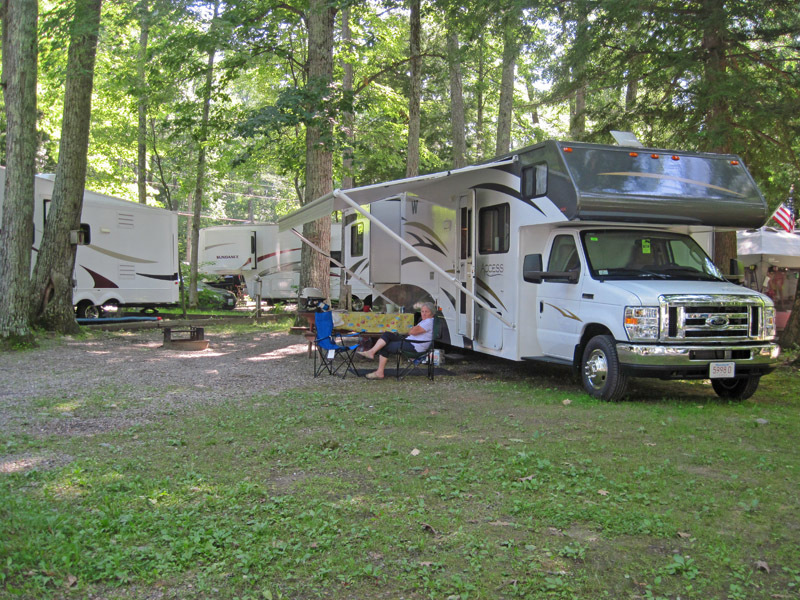 RV sites are equipped with 50 amp 220, 30 amp 110, and Water. 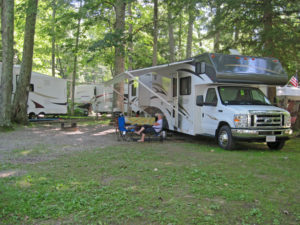 RV sites are $25 per night. This will include RV, one tow vehicle and five people. Each additional vehicle is $14 and/or $3 per person over five people. You will have river access to fish and swim. You will also have access to the pool at the office. 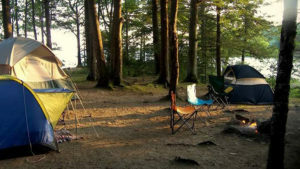 Tent camping is $12.00 per car/per night up to 5 people. Each additional person is $3.00. Our campsites include picnic tables and some have grills. Riverside and shaded camp sites up off the river are available. All sites are within a few hundred feet of the showers, office, pool, and river.